The first two days of the Newport Folk Festival have been wonderful. It’s the most memorable NFF that I’ve attended. Roger Waters supported by My Morning Jacket, G.E. Smith, and Lucius plus appearances by Amy Helm and Sara Watkins made for a special Day 1. Yesterday’s surprises weren’t as dramatic, although to see Gillian Welsh join The Decemberists along with Brandi Carlisle, Hozier, etc. during “This Land Is Your Land” was a treat. Now on to Day 3. For those attending, it’s exciting anticipating what NFF could possibly do to top the first two days, yet almost sad to know it is the last day. Well, time to enjoy some music. 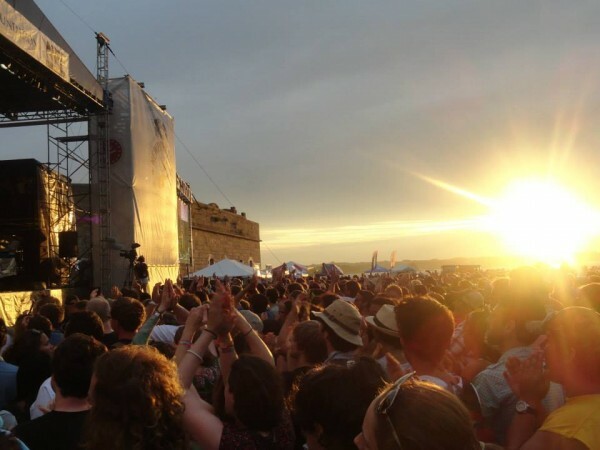 Here’s the Newport Folk Festival July 26th Guide. If you’re going, bring the rain gear. What would a Newport Folk Festival be without rain? Don’t forget today is a very special day with the Dylan tributes likely to be in full force. Dylan fans will want to get to the Museum early to hear Elijah Wald’s (12:00, Museum) findings and reflections of that the faithful day when a 24-year old Dylan plugged in and went electric at Newport Folk Festival. In terms of music, below is a list of the acts performing. The names are listed in chronological order. Unfortunately, not all the artists are covered below. The entire lineup can be viewed via the PDF schedule or by artist on the Newport Folk Festival’s website. If you can’t make it out to NFF, visit Newport Folk Radio Station, who will be streaming concerts throughout the day. Follow us on Instagram to get some up-to-the-minute photos or Twitter to get the occasional update. …which definitely will be the case by whomever graces the ’65 REVISITED (6:15, Fort Stage) finale. Rumors are flying around, from Bob Dylan showing up (his guitar is definitely in town – here is Exhibit A) to a host of “A” celebrities. Whoever shows up, this show promises to be one of the most memorable of not just the Festival but likely the entire year. Photo credit to Michael Panico, who is one of the tallest and nicest guys hanging around Newport Folk Festival.